Converged secondary storage startup Cohesity has added public cloud tiering, encryption and replication to its clustered storage arrays. Automated VM cloning for test/dev to more quickly spin up zero-space clones more quickly. 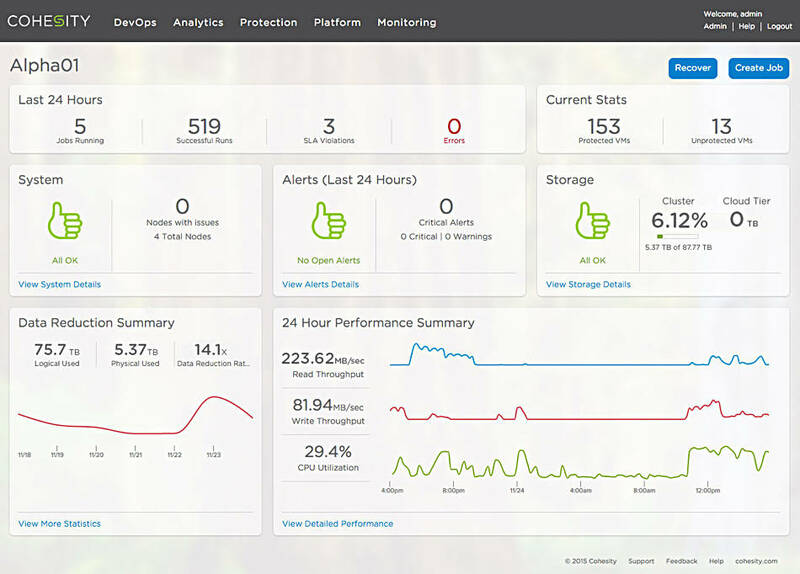 Cohesity user interface dashboard. To have a closer look click the pic. OASIS is a scale out, distributed filesystem. Cohesity is now talking about its Converged Data Platform (CDP) rather than OASIS. It says it wants it to be used by customers consolidating secondary storage use cases, like data protection (backup and disaster recovery), test and development, analytics and file services. Fast primary storage could be provided by Pure Storage, with its all-flash array, and Cohesity adding the secondary storage back-end - see Pure/Cohesity combined idea here (pdf). The archival tier is layered on the existing flash and disk tiers, and is there to offer lower cost for cold data storage. CEO and founder Mohit Aron talks about “replacing the monolithic scale-up architectures that have dominated secondary storage for decades,” including, we guess, mainstream dual-controller arrays as well. The idea of positioning CDP as a single universal platform for secondary data use cases could be compromised by pumping out older data to another silo, the public cloud. Arguably though, archiving is a tertiary data use case, and the storage costs of public clouds make it more attractive to Cohesity's customers to tier to the cloud instead of storing archive data on-premises. V2.0 also adds adaptive throttling of backup streams “to minimise the burden on customers’ production infrastructure.” This is part of Cohesity's quality-of-service measures. We understand Active Directory support is coming, probably later this year, and Cohesity is thinking about service providers and role-based access control.